Does anyone have one of these things? Well, perhaps I’m being a bit harsh, but let me explain. My BFF challenged me to make some scrummy vegan donuts. I wanted to make them a bit healthier than normal so I decided the way forward was to bake them rather than frying. If I were to deep fry my donuts I would have had my oil heated to 190oC, so it makes sense to bake them in the oven at the same temperature. 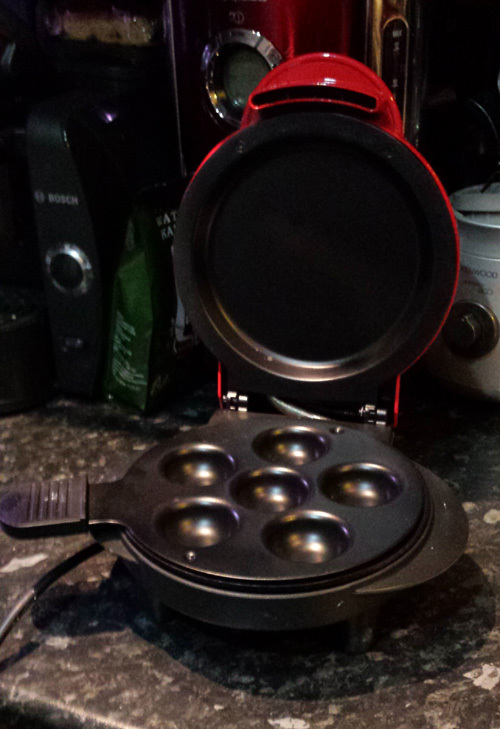 My fandangled cake maker however doesn’t heat up that hot, so I found it impossible to get my little donuts to go golden brown. I had no problem when I re-made them in a patty-pan tin in the oven though, hooray! 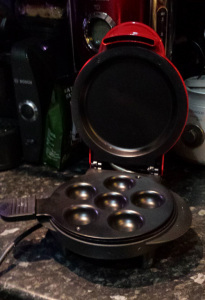 – Grease up your patty-pans (even if they are non-stick). You’ll need 12 holes. 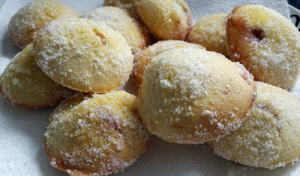 – Sift the flour and baking powder into a bowl and add the sugar. – Fold the dry ingredients into the wet until a smooth, thick-but-pourable batter is formed. 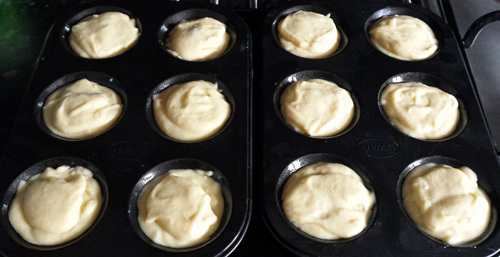 – Split 2/3s of the batter among the patty-pan holes. 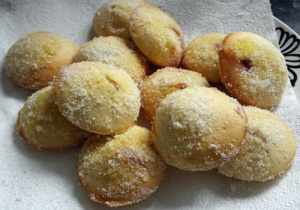 – Add a little blob of jam to the centre of each batter-filled hole. 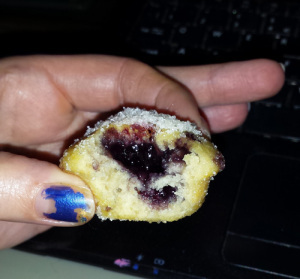 If you’re using a more solid jelly-like jam, you can just use the back of a teaspoon to push the blob into the batter. If you’re using a more runny jam, you may want to attempt to create an indent to the centre of each donut first, just to make sure it stays centralised. 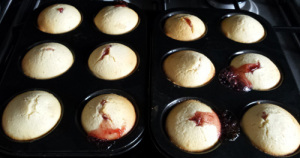 – Cover each jam blob with the remaining batter. You’d shouldn’t be able to see any jam! – Cook for 10 – 12 minutes. This photo demonstrates why its important not to overfill your jam donuts – otherwise you’ll end up with little jammy volcanoes! – Remove from the oven and cool for 5 mins before brushing with melted marg and tossing in caster sugar. I warn you, both times I have made these, me and the hubby have scoffed the whole batch within 20 minutes, whoops!